Who should the president appoint to his cabinet? As President-elect Barack Obama’s cabinet nominees are being finalized with little controversy, we here at Peeling Back the Bark can’t help but think back one hundred years ago and wonder what might have happened if, as newspapers speculated, Gifford Pinchot had been appointed to a cabinet position in William Howard Taft’s administration. Here’s what the Southern Lumberman, an industry newspaper, had to say on November 14, 1908. As chief of the U.S. Forest Service, Pinchot was frequently mentioned as suitable for either secretary of agriculture or secretary of the interior for two reasons. 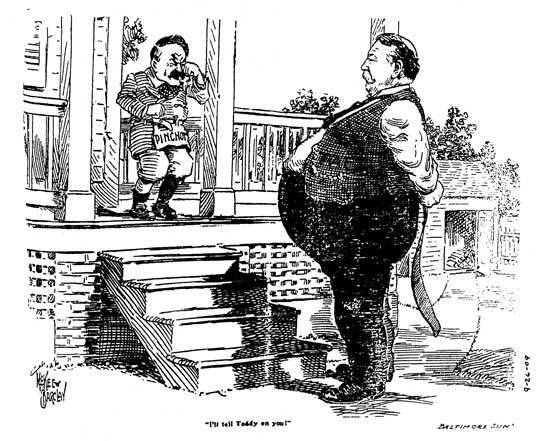 First, he was “the personal friend of President Roosevelt and one of his advisers.” Most reporters assumed that because Roosevelt had chosen Taft as his successor, Taft would want to continue Roosevelt’s policies and use many of his policymakers to do so. The second reason was his grasp of the issues faced by either department; there is little argument that from a knowledge standpoint, Pinchot was more than qualified for either post. “He is a keen student of the great problems of our national resources and their conservation,” observed the Providence (Rhode Island) Journal at the time. The possibility of Pinchot’s nomination for either position raises several questions, but I’ll limit the discussion to two. (This assumes Taft, a conservative who disagreed with Roosevelt’s expansion of executive power, would have even nominated Pinchot.) First, would Pinchot have survived the nomination process? Western newspapers had been calling him “Czar Pinchot” for several years and probably would have demanded blocking his appointment. Western senators, resentful of Pinchot’s growing stature and Roosevelt’s usurping and circumventing of Congress’s power, had already succeeded in reining in Pinchot’s power in 1907 and might have tried to humble him before approving him. It would have been fun to watch those hearings! 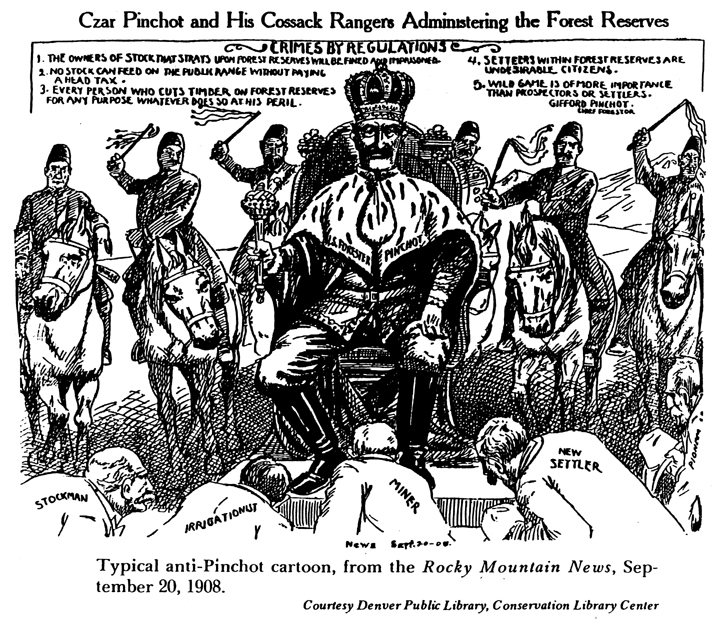 One of several cartoons depicting Gifford Pinchot as a czar bent on controlling all western natural resources. Another one called him "King of the Forest Reserve." Assuming he was approved, the next question is: how long would Pinchot have lasted in Taft’s cabinet? Were the two men going to clash — and Pinchot dismissed — regardless of whether he was secretary or Forest Service chief? I suspect that even as a secretary, once Pinchot’s disillusion with Taft and his policies had set in, he would have sought some way to martyr himself for the cause of conservation. The end result would have been the same, with Pinchot and others trying to pull Roosevelt back into politics in order to challenge Taft in 1912. "I'll tell Teddy on you!" What do you think? 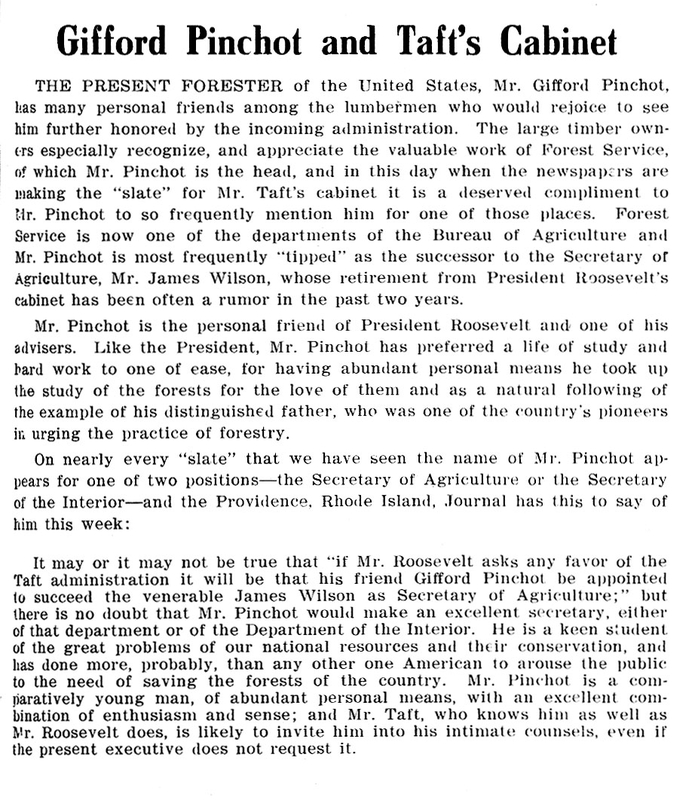 Would Pinchot have made a good Interior or Agriculture secretary under Taft? Would he have picked a fight and gotten fired for the cause, or stayed in the cabinet to fight for it? Would he even have been approved by Congress?